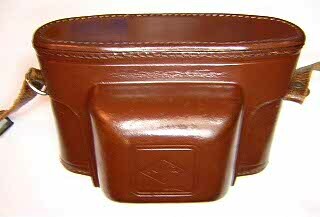 Back in the days before the ubiquitous use of vinyl, camera cases were made of leather. These old cases were sturdy, gave good protection to the cameras, and when cared for properly were quite beautiful. As with the cameras they were made for many of the cases are in sad shape now. The leather dries out, gets torn and scuffed and the stitching breaks. 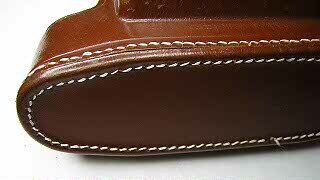 If the holes for the original stitching are intact, these cases can be easily re-stitched to make them good as new. Cleaning with saddle soap and then polishing with shoe polish will make them look almost new. The case show below is for an Agfa Silette. It is dirty, scuffed and the stitching has come loose. Otherwise, the case is in good shape. So, I’m going to re-stitch then clean and polish it. The original stitching was done by machine. 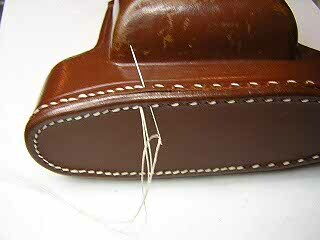 Machine stitching uses two threads, one on each side of the seam. The top thread is pushed through the hole, loops around the bottom thread and then passes back through the same hole. This is repeated all the way around the seam. You can duplicate this exact stitching if you want. I have done it and it looks very nice. It is also very tedious to do. When hand stitching it is much easier to use a different technique. You pass the thread up through the first hole then back down through the next hole. When you have gone all the way around the seam, you go around again only this time go down through the first hole and back up through the second hole. The end result looks just like the original machine stitching pattern, is just as strong, but is much easier. For thread, go to a fabric store and ask for upholstery thread. This is a heavy weight cotton thread designed for leather and vinyl. You can try to match the color of the original thread, but as you’ll see below, an off-white thread will usually be just as good. 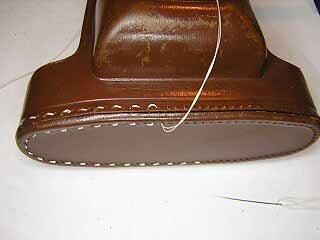 Once you polish the leather, the polish will dye the thread and the result will be nearly identical to the original color. Since you are following the original holes, you don’t need a needle that will punch through leather. Any needle with an eye big enough to pass the upholstery thead will work. I doubled the thread on the case below, but I don’t think it was really necessary. A single thread would be easier to work with. Most cases have a plush velvet lining. You will want to brush the lining with a small brush (like an old tooth brush) and vacum out any dirt. I have a small vacum that was designed for cleaing electroning equipment and it works perfectly for this. If the lining has come loose, just glue it back down. Contact cement works OK, or any general purpose glue such as Elmer’s should work as well. In this picture I’m about half-way around the top with the first set of stitches. Note the gaps between the holes. Here I’ve gone all the way round and about half-way with the second set of stitches. You can see how the second stich fills in the gaps between the first set. Here is the case all finished. I’ve polished it with some chocolate brown boot polish. The polish dyed the thread so that it now looks just like the original. I used a small fiberglass burnishing brush to clean up the metal pieces. Some Flitz polish could also be used to remove any tarnish. If kept clean and polished, the case should be good for a long time to come.